A partner and managing director who joined EHS in 2000, Tom leads broad performance improvement initiatives for Fortune 1000 companies in industries ranging from consumer-packaged goods to utilities to financial services, and more. He has over 35 years of business experience, including extensive work in sales and marketing, business leadership and consulting. Tom honed a broad skill set in sales and marketing, business management and organizational development as an operating manager for over 20 years. These skills and his hands-on approach help EHS’ clients achieve significant performance improvement and drive earnings and growth. Tom is involved in all facets of EHS’ practice, specifically its revenue execution and growth and continuous improvement applications. 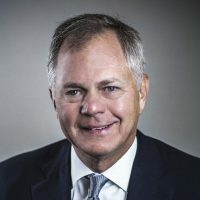 Prior to joining EHS, Tom was responsible for businesses owned by golfer Jack Nicklaus, including worldwide licensing and endorsement entities, golf schools and family entertainment centers. Under his management and oversight, Nicklaus brands and licensed products grew to become one of the world’s largest businesses inspired by a single athlete. Tom began his business career as a sales representative with IBM. Tom serves on the board of Champions Community Foundation, a nonprofit that provides independent shared living and other services to young adults with physical disabilities. Tom earned his MBA at Harvard Business School and his B.S. in mathematics at Bucknell University.